There is a learning curve on our new blog but slowly I am getting it. No use crying over spilt milk,right ? Speaking of spilt milk that was our story today. 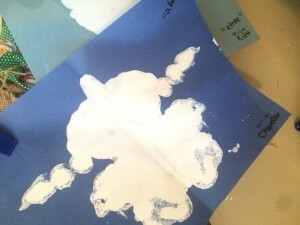 As a child did you ever lay outside looking at the clouds and imagine what they looked like ? I have looked up before and saw dragons and butterflies and many many things. A child’s imagination is an amazing thing. The book is great for patterned reading. On each page the text was predictable . It said ” It looked like a …… but it wasn’t ….. ” The kids enjoy the success they feel as readers with predictable text. After reading the book today we did an art project . 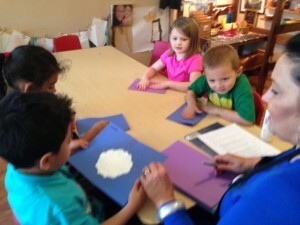 I placed a blob of paint on a blue sheet of paper for the kids and then we folded that paper in half. 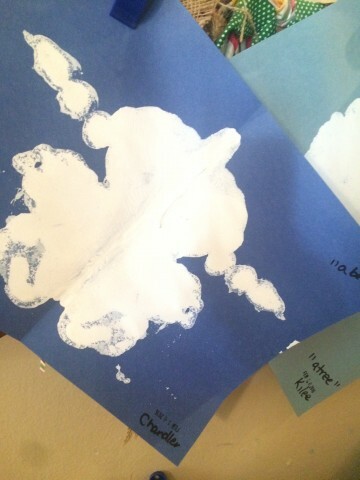 The kids pressed the paper to spread the paint and then we opened it to reveal our own ” cloud.” Then I dictated what they each said their cloud looked like .